NORTH Sydney Council is at the forefront of a campaign to cut traffic speed in Australia’s central business districts in an attempt to curb pedestrian accidents. The council’s traffic committee —which includes representatives of North Sydney police and the RTA, North Shore MP Jillian Skinner and councillors — voted unanimously this month to support the scheme. Now Mayor Genia McCaffery has to fine-tune plans with the RTA to lower the speed limit from 50km/h to 40km/h. She said the proposed new speed would affect only the area from Blue St to McLaren St in the CBD. 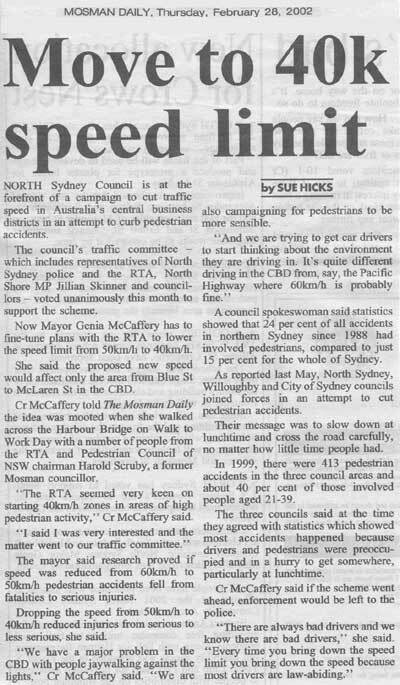 Cr McCaffery told The Mosman Daily the idea was mooted when she walked across the Harbour Bridge on Walk to Work Day with a number of people from the RTA and Pedestrian Council of NSW chairman Harold Scruby, a former Mosman councillor. “The RTA seemed very keen on starting 40km/h zones in areas of high pedestrian activity,” Cr McCaffery said. The mayor said research proved if speed was reduced from 60km/h to 50km/h pedestrian accidents fell from fatalities to serious injuries. Dropping the speed from 5Okm/h to 40km/h reduced injuries from serious to less serious, she said. “We have a major problem in the CBD with people jaywalking against the lights,” Cr McCaffery said. “We are also campaigning for pedestrians to be more sensible. A council spokeswoman said statistics showed that 24 per cent of all accidents in northern Sydney since 1988 had involved pedestrians, compared to just 15 per cent for the whole of Sydney. As reported last May, North Sydney, Willoughby and City of Sydney councils joined forces in an attempt to cut pedestrian accidents. Their message was to slow down at lunchtime and cross the road carefully, no matter how little time people had. In 1999, there were 413 pedestrian accidents in the three council areas and about 40 per cent of those involved people aged 21-39. The three councils said at the time they agreed with statistics which showed most accidents happened because drivers and pedestrians were preoccupied and in a hurry to get somewhere, particularly at lunchtime. Cr McCaffery said if the scheme went ahead, enforcement would be left to the police.